Anyone who’s walked into a voting booth and scratched their preference onto a piece of paper knows the same thing: the voting process suffers from a dire lack of technology. Humanity put a man on the moon in 1969–why are we still voting on paper? 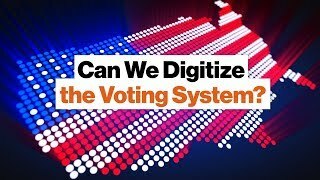 Going digital isn’t just a matter of convenience, but one of accountability—citizens the world over are increasingly losing trust in the democratic system, from miscounted votes, to denying eligible people the right to vote at all. So just how much can we digitize the act of voting? Perhaps bitcoin [BTC]—a public ledger technology where information is irreversibly recorded—can build a better system. Here, Internet pioneer Brian Behlendorf considers two aspects where bitcoin [BTC] can help, and one where it absolutely can’t. Better tech can end voter discrimination at polling stations, and falsely reported totals at the state and national levels, but will we ever be able to vote on our mobile devices from the comfort of a blanket fort? Don’t get your hopes up. Brian Behlendorf is the executive director of Hyperledger; for more info, visit http://www.hyperledger.org. Transcript: Many people have asked: can bitcoin [BTC] technology help provide answers to challenges that typically have suffered from lack of technology, or that has suffered from poor technology applications. One of those being the way that voting works in the United States. I think of this in three distinct phases. There’s the phase before voting where keeping track of who is registered to vote and where they’re allowed to vote, it’s been harder than it should have been. We have a lot of examples of people showing up at polling places and being denied the right to vote and it seems like paperwork goes missing and people get removed from voting roles, that sort of thing. A public ledger that tracked who was registered to vote where and allowed people to look at that from their home machine and then confirm that when they showed up at the poll, would do a lot to reestablish trust in the process of registering to vote and validating that everybody who is entitled to vote is able to do that, providing an independent verification of that. There’s a second phase I’ll get to in a bit, but there’s a third phase, which is after the vote, when you’re taking the totals that come from a polling place, that come from vote by mail for example in Oregon. We have to kind of trust that the system works. We have to hope that everything is counted correctly at the local level and then it’s totaled up correctly at the state level and then reported nationally et cetera. And we’re fortunately at a point where the basis of that trust hasn’t been violated yet, but in many countries it is. In many countries there’s not a lot of confidence that the total from a polling place is accurately summed up. So using a distributed ledger not to track the individual votes but to track the totals from each of the polling places would be a way to allow the public to understand: ‘Okay the local polling place I went and voted at is reporting a thousand votes, 500 for candidate X, 500 for candidate Y, that seems about right. I don’t know if my vote specifically counted, but I know that at least the polling place I was at counted appropriately and they didn’t try to pretend they were 100,000 votes.’ So at the beginning of that process and the tail end of that process using a public distributed ledger to record that makes a lot of sense. But in the middle, the actual act of walking into a booth and registering a vote, or a lot of people want to do voting by mobile device or by computer; I’m very worried about the digitization of that. Our computers fail us all the time and malware and other threats could really step in and make it so that I think I’m voting for one candidate but it gets recorded for another. And we have to think, in the United States, we care quite a bit about the confidentiality of our vote even to the point where I get no receipt, I can’t go to a bar and prove that I voted for somebody and get a discount for it—that would be considered bribery. So we can’t simply come up with a system that puts all the original votes into a public ledger and provides proof that somebody voted a certain way or that becomes a corruptive process. So I think we still need voter-verified paper ballots as a path to auditing, but with the registration at the beginning and the summing at the end conducted by a public ledger I think we would do a tremendous amount to reestablish confidence in the voting system.